“No one else bid,” attorney Alan Futerfas said in a packed Manhattan courtroom on Thursday, so “he’s stuck with the painting." When Donald Trump offered to pay $10,000 from his personal charitable foundation for a six-foot oil portrait of himself, the future president only meant to “get the bidding started” during a 2014 auction at his Mar-a-Lago resort, his lawyer told a New York judge. Trump’s lawyer offered the account as one of several reasons why New York Attorney General Barbara Underwood’s lawsuit against the Donald J. Trump Foundation should be tossed out, arguing that the transactions at the center of the case have innocent explanations or were corrected by the charity. For example, Futerfas said it was “troubling” that Underwood would focus on a payment that was made to benefit a charity that aids children and young adults with developmental disabilities. He also claims the suit is politically biased, part of an effort by Democrats to undermine Trump’s presidency. But Underwood claims in the lawsuit that the nonprofit was little more than Trump’s “piggy bank,” and that legitimate donations were overshadowed by rampant violations of state charity law and the use of donated funds for business purposes. She’s seeking to dissolve the charity and to ban the president from serving on a New York not-for-profit for 10 years. “It is beyond dispute that these were improper self-dealing transactions,” Yael Fuchs, a lawyer for the attorney general, said at the hearing. New York State Supreme Court Justice Saliann Scarpulla ended the hearing without making a ruling, after largely shutting down Futerfas’s assertions of political bias by Underwood. “I don’t want to get into that,” Scarpulla said. The case will instead hinge on Underwood’s claims about campaign finance violations and the various transactions by the Trump Foundation, including the portrait acquisition. 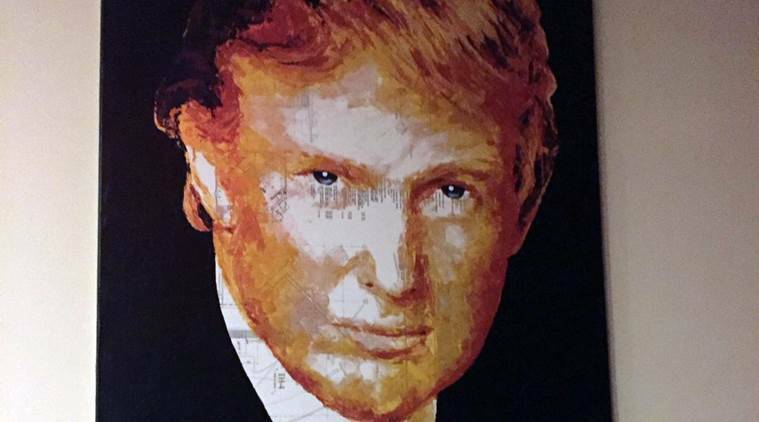 Underwood alleges that after Trump misused charity cash to buy the painting, he gained further benefit from the work when the Trump Organization hung it on the wall of Trump’s hotel in Doral, Florida. “This was improper self-dealing, since foundation money was used to buy a painting to decorate a Trump business property,” the attorney general said in a court filing. But Futerfas says the portrait only graced the hotel’s walls because staff found it sitting in a storage room and didn’t realize it belonged to the charity. Shortly after the election, amid media scrutiny, the hotel returned the painting to the charity and paid it $185.82 plus interest as a fair rental value. $100,000 used in 2007 to pay a Mar-a-Lago legal settlement. Underwood says the payment was illegal because the foundation wasn’t a party to the suit; Trump says the money eventually went to charity anyway. $158,000 used in 2012 to help pay a $1 million “Hole-in-One” golf award. Underwood says it was an illegal use of charity cash for a business obligation; Trump says the money was used exactly how the foundation said it would be — to benefit a charity — but that the foundation was repaid anyway “out of an extraordinary abundance of caution.” $25,000 paid in 2013 to a political organization helping to re-elect Florida Attorney General Pamela Bondi. Underwood says the donation violated the Internal Revenue Code; Trump says the improper contribution was due to a back-office error and that the foundation “took immediate remedial steps” to correct it with the IRS and reimburse the foundation. $5,000 paid in 2013 to the DC Preservation League, a charity that helped with the conversion of the historic Old Post Office in Washington into what is now the Trump International Hotel. Underwood says the money was used to improperly advertise the Trump Hotel Collection; Trump says the benefit to his business was “incidental” and he repaid his foundation. $32,000 paid in 2015 to a land-preservation organization. Underwood says the money wrongfully benefited an entity that manages land used for recreation by Trump’s family. Trump said the payment was self-reported to the attorney general’s office and his foundation was reimbursed. The judge said she can’t decide the case until after an appeals court rules in a different case on whether Trump has presidential immunity from litigation in state courts. In that lawsuit, former “Apprentice” contestant Summer Zervos accuses Trump of defamation for denying her allegations that he groped her. Futerfas said the case against the Trump foundation is wrongfully focusing on a few transactions out of hundreds that involved money going to organizations in need, amounting to nearly $19 million. Every penny raised by the foundation was donated to charity, aside from $1.7 million being held up by the litigation, Futerfas said.